This was an amazing story about finding a new purpose, revenge, living your life, and redemption. Luke is back from war and has lost the ability to walk, for now. Luke is having to go to PT and work very hard to get the use of his legs back due to being hit by an IED. However, he feels like a fraud. His twin, Matt, is a horse trainer, and just wants his brother to feel better. Matt notices that Luke seems to be coming back to him while working with the young horses. Rory is the resident gay citizen in a very conservative town. Despite his gayness, he is also incredibly wealthy and successful. His past has been haunting him for years and he’s doing everything he can to exact his revenge. Because he’s smart and hilarious, wants to help the local people keep their land away from a developer, he has to think quickly on his feet when he makes a horrible first impression on Luke. With crazy, vengeful people trying to tear Rory down, he and Luke have to navigate the town and in doing that, they develop feelings. I think that their relationship was more organic because even though they were instantly attracted to each other, they didn’t necessarily act on those impulses right away. When push comes to shove and Rory can’t outrun his past anymore, will Luke stick by him? I really enjoyed this story and I can’t wait to see if Matt gets a story, because he’s such a huge support in this story. I really enjoyed this book. I instantly loved both Rory and Luke. Their banter just made me laugh and I couldn't help but smile every time they were together. Rory is out for revenge and I don't blame him and how he is going about it is just perfect. We don't know until late in the book why, but once we find out, we want blood! The love and tenderness between Rory and Luke is amazing. You can't help but root for them. I love all the secondary characters as well, they just feel like people you would know or want to know and have as family and friends. I just hope we get Matt's story next or soon, I want that man happy! Great start to a new series and I hope the next installment comes out soon! 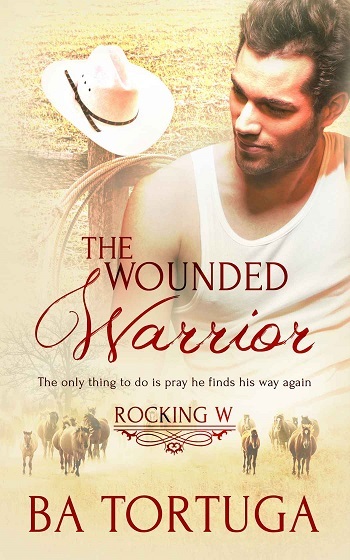 Reviewers on the Wicked Reads Review Team were provided a free copy of The Wounded Warrior (Rocking W #1) by BA Tortuga to read and review.